Exxon said demand for petrol was lower. Oil giant Exxon Mobil made a profit of $11.68bn between April and June, breaking its own record for the highest quarterly profit by a US company. The 14% rise in profit was thanks to the surge in crude oil prices, which were almost double the price they were in the same period a year earlier. 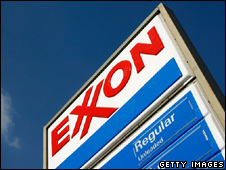 But profits disappointed investors, who sent Exxon's share price down 3%. Profit growth was dented by declines in production, reduced demand for petrol and lower margins on refining. Sales of petrol and related products fell from the year before because of lower demand, the firm said. Crude production declined 8% in the quarter, partly due to disruption in Venezuela and Nigeria. "They are spending $25bn a year on exploration4, and they are not even breaking even now in terms of production growth," said Gene Pisasale of PNC Capital Advisors. During the quarter, Exxon also took a charge of $290m related to a penalty imposed on the firm for its role in Exxon Valdez oil spill disaster. Last month, the US Supreme Court ruled that the $2.5bn (£1.25bn) fine initially imposed would be cut to $500m. Exxon Mobil won the right to appeal against the damages bill for the 1989 Alaskan oil spill after arguing the initial penalty was excessive.